Maximizing pork production involves many factors. Everything from air quality and temperature control to feeders and flooring will have an effect on profitability. Optimizing the animals' environment can add to your bottom line. One very important way to save fuel is to have good air mixing so as to prevent temperature stratification with warm air staying near the ceiling and cold air collecting at animal level. Mixing or stirring up the air in the swine unit produces less of a temperature difference from ceiling to floor and more uniformity from wall to wall. Proper ventilation techniques and air inlet management are very important in promoting good air mixing in cold weather. Double L Inlets help to keep your air clean, lower heating costs, and improve pig performance. Attic Inlets are structured to take warm air from the attic to heat the living area of the hog barn. The air that you and your pigs breathe cannot be seen and is easily taken for granted. Clean air is one of the most important parts of your livestock operation. The idea of using warm air from the attic to heat the living area was proven by university testing to save money on propane expenses and improve environment conditions. For better air mixing, Double L Wall Inlets are designed to direct airflow towards the ceiling, allowing fresh air to mix with warm air, evenly distributing tempered air throughout the room. 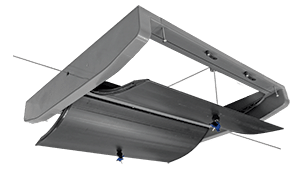 TJW TopJet Gravity Wall Inlets have counterweighted blades that automatically open and allow fresh air to mix with warm air, evenly distributing tempered air throughout the animal room. Engineered to open at 0.05 to 0.07 static pressure, each gravity inlet blade has an adjustable counterweight for balancing multiple inlets at different static pressures. 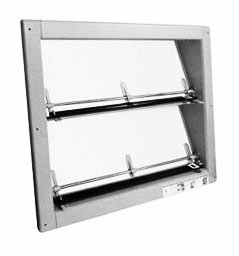 Double L Ductwork easily adapts as a replacement for continuous baffle. Ceiling Mount Ductwork allows for two-directional air delivery from a center slot in the ceiling. The air supply is from the attic or pre-heated hallway. Corner Mount Ductwork is excellent when used to pull air out of the attic. 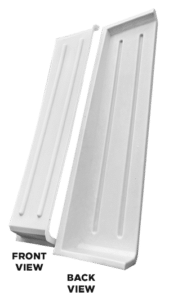 Ideal for new construction or as replacement shutters, Double L's EcoTight Shutters or PVC Shutters are constructed of tough PVC to handle harsh environments. 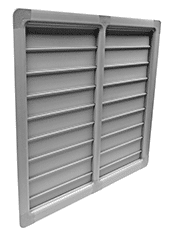 Custom made to specifications, Double L's PVC Shutters are low maintenance, can withstand heavy pressure washing, and are simple to repair. They will never rot, rust, or corrode and all parts are replaceable. Flooring is another key factor in optimizing the performance of your pigs. The purpose of hog flooring is to provide good traction, a comfortable surface, and durability. Hog slats should be designed, constructed, and maintained so as not to cause injury or suffering to pigs standing on it. They should also allow manure to filter readily, helping to maintain a clean, healthy environment for your pigs. 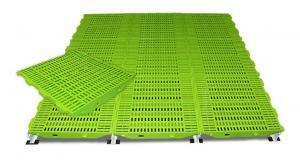 Pig flooring that is easier to clean improves labor efficiency and reduces the transmission of diseases. Double L Group offers flooring options designed with these important characteristics in mind: nursery floor, farrowing floor, cast iron floor, plastic floor, and flooring accessories. Double L's 4' x 6' Wean-to-Finish Pig Mat helps improve your pigs comfort, environment, health, and productivity by keeping nursery pigs warm and dry while avoiding diseases, all of which helps to get pigs off to a fast start. Besides being great for creep feeding, the 4' x 6' polyethylene Wean-to-Finish Pig Mats are non-conductive and act as a barrier between the pig and the cold floor. 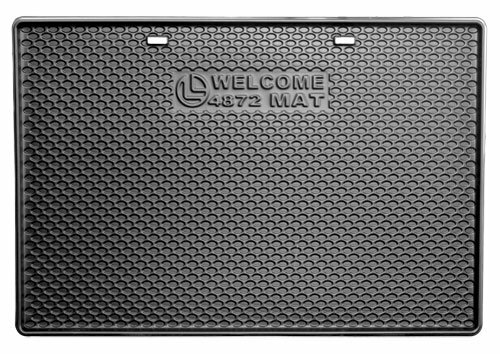 Easier to lift than rubber mats, Double L's Pig Mat has handles and are lightweight for ease of carrying, transport, and storage. 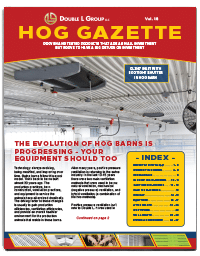 Browse through our Hog Gazette catalogs to learn even more about Double L products and the swine industry.